It has been a busy 2017 and it is not over yet. As the Northern Hemisphere slows down after a very busy Hobie® summer. The Southern Hemisphere (while parts of it never stopped racing) gears up for a busy time. It is time to reflect a bit about what has happened. The 2017 Hobie Multiworlds and Europeans was a great success. 287 entries from 24 counties, 3 new world champions, all three teams were first time winners (Mitch Booth has previously won many world and Olympic medals but the first time with his daughter Rita). What was even more pleasing was the high number of youth sailing. The Dragoon numbers were back and the kids showed extremely high level of skill. The Hobie 14, still keeps amazing everyone with growing back in strength. 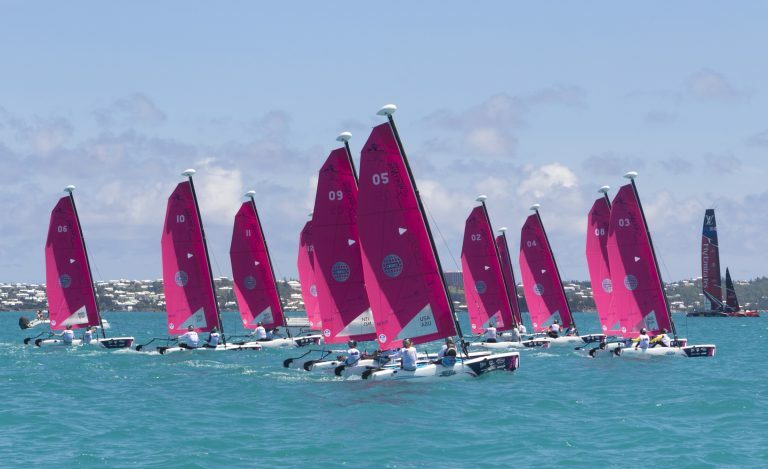 The Hobie 14 again captures everyone, from male, female and youth sailors. Low cost and not a high-tech boat allows it to be both affordable and to be sailed in all weather conditions. Big seas, strong winds and the Hobie 14 just excels in those conditions. You can put a Hobie 14 in conditions that the high-tech boats just can’t handle. In fact the Hobie 16 is in the same category. So it was great to see the numbers attending the Multiworlds and Europeans and we appreciate those travelling from overseas to make such an effort to attend. Also at the America’s Cup was the current Hobie 16 World Champion Daniel Bjørnholt racing in the Red Bull America’s Cup Youth Challenge. Daniel too the young Hobie Wave sailors on a tour of the Youth America’s Cup compound and explained what it took to be a champion sailor. Hobie racing is more about just sailing around the buoys. The Fiji Hobie Challenge is also about long distance racing, endurance while enjoying yourself after racing. It is a good adventure of long distance racing with a great group of friends. Of course, we have more long-distance regattas coming up soon which shows the importance of having a boat that can ‘go the distance’. What is important is that no matter what you do, keep your Hobie out racing. Enjoy the boat, the sun, wind and waves.